Please note this meeting starts at 3pm, not the regular 10:30am time. Dr. Dietrich Haubenberger of NIH will speak about the current status of ET research. He has spoken previously to our group. To say he is an expert on the subject is an understatement. You won’t want to miss this meeting! On April 7, 2016 I spoke with Joe Menetski of the Foundation of NIH (FNIH). We had a very good discussion about an exciting idea that you will hear more about in the upcoming months. Joe has been with the FNIH for several months. Prior to that he worked for several pharmaceutical companies for over 20 years. He said that the first question that these companies ask when developing a new medication is how do doctors diagnosis the condition. On April 8, I spoke to Dr. Katrina Gwinn of NINDS and brought this up with her. To do a better job of diagnosing ET, she feels that there needs to be a better job of grouping patients – that share a number of things in common. To do so, she mentioned using blood tests & possibly imaging. She feels that biomarkers will be very important in this (see the announcement for the most recent biomarker study). Coincidentally later that day, she was going to have a discussion with Trequant (see our post regarding their “watch”). The findings from the “watch” could be another means of collecting data leading to better groupings. The conference entitled Essential Knowledge Gaps in the field of Essential Tremor was held on May 11-12, 2015. It was broken into 5 sessions – (1) Phenomenology & Phenotypes, (2) What can we learn from available therapies & what do we need to implement clinical trials and advance clinical research in ET, (3) Physiology of Essential Tremor, (4) Pathology, and (5) Genetics. For each of the above discussion points, an expert in the respective field made a presentation regarding the topic. The discussion was then open to all of the participants. This was followed by a summary of what had been discussed. As one who has Essential Tremor and is not a doctor, I was impressed by how it was conducted and the points that were made. I am optimistic. 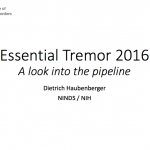 There are big challenges ahead – not the least is – we need a better understanding of what Essential Tremor is. The various working groups will now take their respective summaries and put together a more specific plan for moving forward. NINDS did a good job with the conference. I am confident that they will continue to play a constructive role in ensuring that follow up occurs. In a little more than a month, NIH will host the Essential Tremor Conference – bringing together experts on ET from across the country as well as some from other parts of the world. In speaking individually with members of HopeNET’s medical advisory board, they are optimistic. The staff from the National Institute of Neurological Disorders & Stroke has done a good job of organizing the conference. They have made an effort to include some researchers that are outside the usual ET research community. They have also made an effort to include younger people. In my conversations with the staff, I get the sense that they want this conference to be a success that ultimately benefits all of us with ET. HopeNET is playing a role in several different ways in the conference. I will be there attending the sessions. I look forward to sharing with you what I learn. If you have any ideas that you’d like to share with me prior to the conference, please let me know. Dr. Dietrich Haubenberger, the Director of the Clinical Trials Unit of the National Institute of Neurological Disorders & Stroke’s Intramural Research Program, made the following presentation to both the Columbia and Silver Spring groups. He was accompanied by members of his staff – a neurologist (in Columbia from Thailand & in Silver Spring from Romania) and a neuroscientist in both situations. By the way, Dr. Haubenberger is from Austria. After the presentation, members of the support groups had the opportunity to ask questions of Dr. Haubenberger and his staff. For two days in late September, the National Institute of Neurological Disorders and Stroke, NINDS, on the NIH campus held its eighth Nonprofit Forum called “Progress Through Partnership,” which provided a wonderful way for nonprofits who support and educate about their specific medical condition to learn how clinical and translational research at NINDS works. Forty-three health organizations or patient foundations were there in attendance. Two things were notable about this forum, one being that Dr. Story Landis, Director of NINDS gave remarks along with others from NINDS in which she as well as the others made it clear that they want a closer relationship with the patient foundations and nonprofit organizations. With a closer relationship, they can conduct more effective research as a result of understanding patients’ needs, and it makes it easier to recruit patients. Also of note was that the forum panel consisted of patient advocates who had created nonprofits/ foundations that in the not-so-distant past partnered with NIH in finding treatments. They were there to report on their accomplishments to us. What encouragement! A few were foundations for rare diseases that affect between 2200 to 1 million people, which makes it more remarkable that they were able to make progress and see pharmaceutical products come to market. Panel speakers were generally people who either had a condition themselves or with family members who had it. The panel was impressive not because they had perfectly figured out how to work with NIH to make things happen but for their personal perseverance and accomplishments. In the process they got to know NIH clinical researchers and worked together with NIH to reach the mutual goal of stimulating research and seeking cures or clinical interventions. Outside of NINDS they made inroads through the use of lobbyists, created patient registries, raised research funds, sought grants, conducted their own surveys, and created or identified Centers of Excellence such as university medical centers that have been established to conduct research and provide the best care for patients with a particular condition. One speaker described how their nonprofit that supports the rare disease Ataxia went from having zero pharmaceuticals to having many in part because they created a patient registry that could easily and very quickly help the pharma companies get patients for a study. 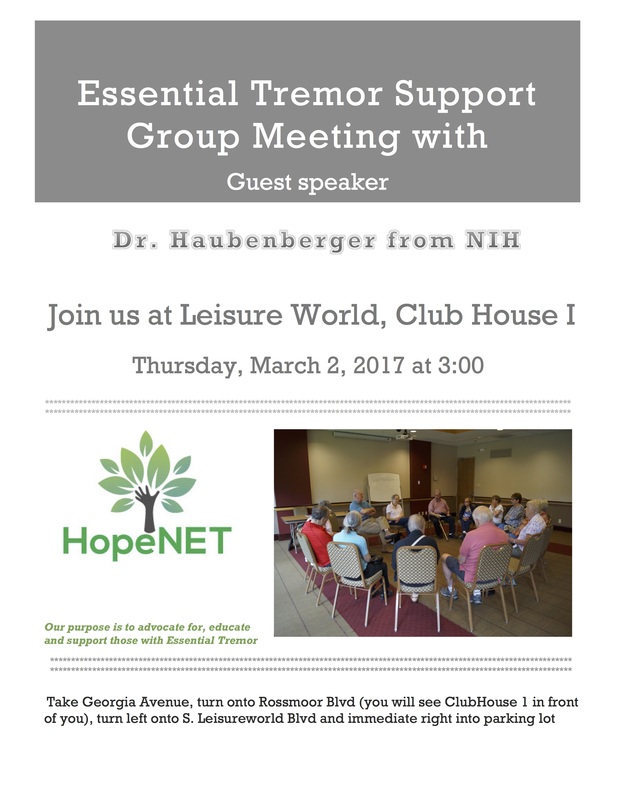 This information should bring hope to those with Essential Tremor since it is not a rare condition but one that affects 7 million potential customers of a medication.